Read Post of 11 March 2012 for background to this 4-part series. Encircled by the Christ Light of your soul. As Heaven rains and Earth burns, Heart of twins flowers with diamond shine. May I invite you to contemplate and decode the meaning of this tablet? 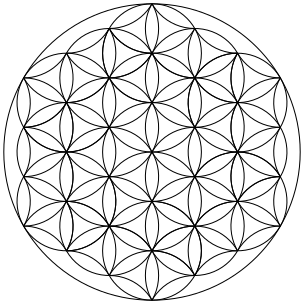 Visualise the Flower of Life symbol (shown above) seated on your heart chakra as you do so. Additionally, you may listen to the Hall of Life energy transmission gifted by Thoth on the full moon of March, for revitalising the physical heart and correspondingly, your entire body. Many Blessings, Ann. Feeback – I listened to the flower of life transmission on Sat 7 April and felt nothing special. But On 8 April early morning, I dreamt of meeting up with u (your higher self body looked diff from your present image) and travelling on a bus with you to a place where I saw a boy toddler in a golden brocade long chinese jacket like those of the chinese emperor. The jacket is heavily threaded with thick gold and interwoven rainbow colour threads with rose floral patterns. In my mind, I kept saying to the boy that it was woren by me in the past. Guess the roses are flowers of life manifestations. The boy is tibetan 2nd buddha, guru rinpoche same energy manifestations as thoth.